The bit of rain we got here really did cool us down for a few hours Saturday morning, and it felt great. We’ll see if it was enough to bring up some seeds. Somehow the few rains we’ve had this summer have fallen much heavier to the west and south, sometimes the north too. Guess rain dances need to be a more frequent part of the workday. While we dance we’ll watch to see if the cucumber beetles and shield bugs allow our main planting of winter squash to come through. We’re trying to make this farm as sustainable as possible, and we know you care about that too. Sometimes our shares contain a fair amount of packaging. We do this to ensure the quality of your food. You can help us reduce our footprint and keep our operating costs down by returning what packaging you feel is clean and appropriate. A couple things we could really use are brown paper bags and the little green pint boxes your cherry tomatoes come in. If anyone has a hookup on produce boxes of any type, PLEASE let us know! We’re really into reusing such things that usually end up as trash or recycling instead of buying new. If you would prefer to read your newsletter online, please let us know and we’ll be able to print fewer copies. Next week we hope to send out shares in reusable bags. We will number the bags and allow 3 for each shareholder so you know you’re always getting your bag. As long as you bring a bag back each week we’ll each have one. Having a third lets you miss a return week. If you don’t we’ll simply send your share out in another form of packaging. Remember the newsletter and all kinds of great things are happening online. Check us out at seedsofhopefarm.org. With this week’s generous share of potatoes, try making your family some fries, only baked. You’ll think less of fast French fries after you try this simple and very tasty recipe. 1. Scrub and quarter a pile of potatoes. Set them into a pot of cold water with a handful of garlic cloves, add a half a palm of salt, and boil until almost tender. You don’t want to overcook them at this point because they will fall apart. 2. Drain the pot and toss well in olive oil so the wedges are covered, spread out flat on a cookie sheet, sprinkle with salt. 3. 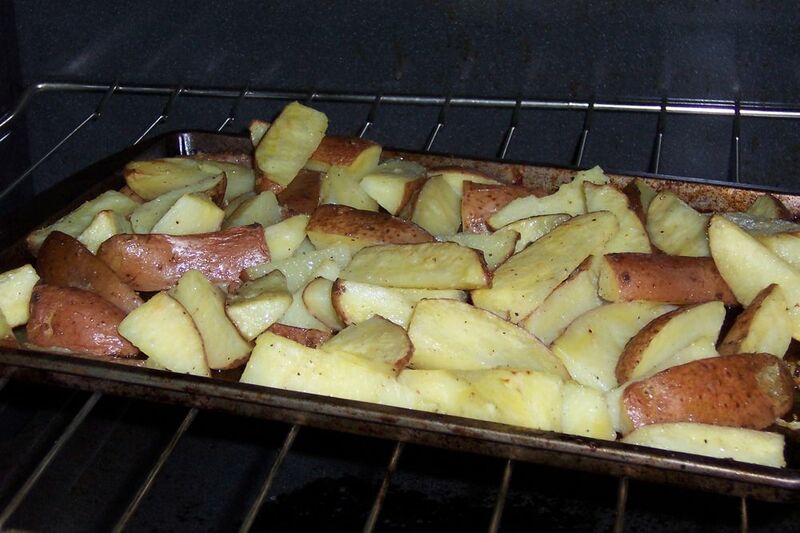 Bake at 425 degrees for 10-30 minutes depending on the size of the wedges.Stir a couple times and flip the pieces. Done when potatoes can be easily pierced with a fork. 4. Try a few extra spices: Italian seasoning mix, garlic powder, dill, or rosemary. Fresh herbs can be chopped and added when the fries are almost done. *This recipe is an adaptation from Jamie Oliver. If you’re ever looking for more produce, we usually have extra of everything, and we offer it to our members at discounted prices. For example, if you are wanting to make a tomato sauce, can some okra, or impress your work friends with a baba ganoush, just let us know! This is a good share for your family and neighbors. In fact it’s an exceptional share because the farm has given a lot this week. That’s the beauty of a CSA. Some weeks we’ll have a little more, some a little less. This is one of those highly productive times of the growing season so let’s enjoy the bounty while it lasts. Your bag will not be this full every week!